Sure, the mountains in summer can be a great time. Long days, warm temperatures, and beautiful scenery make for some of the best hiking, biking, and kayaking in the world. But just because the temps are getting low doesn’t mean you can’t have fun! Here are some of our best ideas for what to do in Glenwood Springs in the winter. Winter hiking doesn’t have to be an epic expedition — there are lots of places to hike in Glenwood Springs that are open and accessible year round! Red Mountain’s trailhead is right at the edge of town, so you won’t need four-wheel drive to get up to the base, and follows four miles of well-maintained dirt road all the way to a scenic overlook above town. The road will have some snow on it during the winter, but with snow spikes strapped to your shoes — or even just good hiking boots — it’s a good way to get the blood pumping for an afternoon. Hanging Lake is slightly more difficult to get to, but it’s worth it — above the lake, Spouting Rock pours water seemingly from nowhere, and the surrounding waterfall in the winter is a sight to behold. In really cold weather, Hanging Lake freezes over, collecting snow in a smooth, pristine backdrop for the curtains of ice that hang from the cliffs above. The hike to Hanging Lake is short and steep, starting a few miles east of Glenwood Springs from the Glenwood Canyon Trail and rising sharply up to the lake. You’ll definitely want to bring shoe spikes and warm clothes since most of the trail is shaded, but the grade will warm you up in no time. 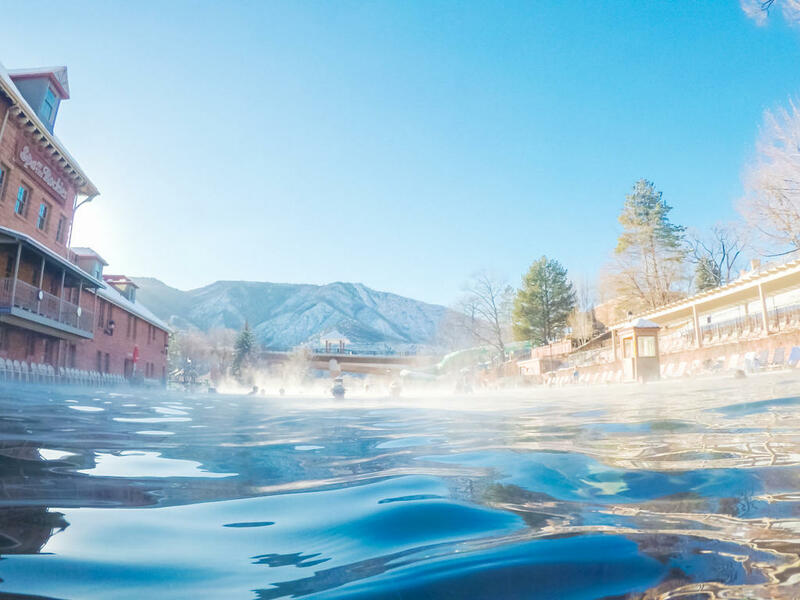 Nothing warms you up on a snowy day like a dip in one of Glenwood Springs’ famous hot springs. Even in the snow, you can enjoy a swim or a relaxing afternoon in the naturally-heated waters at one of the city’s three facilities. First is the world-famous Glenwood Hot Springs Pool, the largest hot springs pool in the world. The water comes out of the mountains at 122 degrees, but it’s cooled down to a relaxing 104 degrees in the therapeutic pool — complete with bubbling massage chairs — and a balmy 90 degrees in the 30,000-square-foot main pool. If you need a detox, stop by the Yampah vapor caves — the only natural vapor caves in North America. Steaming hot water flows through the cave floors, heating the interior of the cave to a pore-opening 110 degrees and filling it with mineral-rich steam that relaxes and soothes you. There’s also a cooling room nearby, or you can dip into the small pools and tubs within the caves. New on the scene is the Iron Mountain Hot Springs, which opened in 2015. Instead of one big pool, Iron Mountain has 16 smaller, individual pools heated to a variety of temperatures from 98 to 108 degrees, so you can have the exact soaking experience your sore muscles are craving. Sunlight Mountain is the best-kept secret in the Colorado ski scene, with 700 acres of skiable terrain and 2000 feet of elevation gain. Sunlight’s grounds offer terrain for all skill levels, from the gentle beginner slopes on the west side of the mountain to the steep trees on the East Ridge — the steepest lift-accessed run in Colorado — and everything in between. Another major benefit of Sunlight is cost. We won’t sugar-coat it — skiing with a family can be very expensive. Most of the big mountains in Colorado cost closer to $200 than $100 for a single-day ticket. At Sunlight, a single-day ticket is only $75 cutting the cost of your tickets more than in half — and with Hotel Colorado’s Ski, Swim, and Stay package, kids ski for free! If your stomach is grumbling after all that adventuring, head downtown to check out one of Glenwood Springs’ many eateries! Whether you’re looking for an intimate, romantic setting for a couples’ getaway, a casual brewpub with comfort food and local beers, or a quick slice of pizza, you can find whatever you need within walking distance of downtown. No matter the season or what you like to do, Glenwood Springs has the perfect getaway waiting for you!